Every so often, we hear stories about young entrepreneurs who follow their passion, generate a deep connection with customers, and don’t back down from a challenge. While these entrepreneurs undoubtedly face obstacles throughout their journey, they have the grit, fortitude, and intelligence to make a significant dent in the universe. It is rare to find all of these attributes within a single entrepreneur. Yet we have found just that. Today, we want to share the story of one young entrepreneur who is doing just that. Her name is Sydney Steele and she is the founder of The Cash Monet LLC, an online store that sells prints of Sydney’s hand-painted artwork. “I am dedicated to putting blood, sweat, and tears into building this business from the ground up,” she said. Her work is certainly paying off. The 20-year-old Syracuse University student has thousands of fans and followers who eagerly anticipate her next creation. The Cash Monet is a promising young startup that is in the capable hands of a young, up-and-coming creator. Ever since she was a child, Steele has been interested in both art and entrepreneurship. At Fifteen-years-old, she started her first business – a custom sneaker shop called Syd’s Souls. She ended up selling hundreds of personalized speakers to satisfied customers, quickly recognizing that she experienced true joy when creating and selling her art to others. As she grew older, her passion grew for pop culture, art, and business. Ultimately, she recognized that by combining both of these passions, she could live a life that is aligned with her true purpose. Understanding that she wanted to dedicate her life to this type of work, Steele enrolled at Syracuse University’s College of Visual and Performing Arts. At the College, she is studying illustration. Her passion for art has only grown by studying with some of the best art professors in the country. College is difficult for many students. Most struggle with the material and the intense work ethic that is required. That said, Steele has thrived at Syracuse. Even though she could have taken a break from her entrepreneurial endeavors to focus exclusively on her courses, Steele decided to take what she is learning from the classroom to start The Cash Monet. By doing this, she is one of few university students juggling both their coursework at a prestigious university and a young, thriving business. Steele founded The Cash Monet in the summer of 2018. Like many entrepreneurs, she founded the business to pursue a passion that she had and to solve a pressing problem in the marketplace. Simply put, Steele started The Cash Monet to sell creative artwork at affordable prices. Her art targets different ages and demographics across the United States. Even though she started The Cash Monet several months ago, she is already followed by thousands of intrigued customers. Upon visiting The Cash Monet’s website, you will immediately notice a wide range of colorful prints that are available for sale. The prints range from a portrait of the Kardashian family to a beautiful abstract painting of a dancer to a fun print of champagne and donuts. You will quickly discover that Steele has an eclectic style that surprises and delights novices and art experts alike. Visitors can purchase portraits, pop culture art, abstract art, cartoons, and much more. Through her art, Steele works to build connections with others. 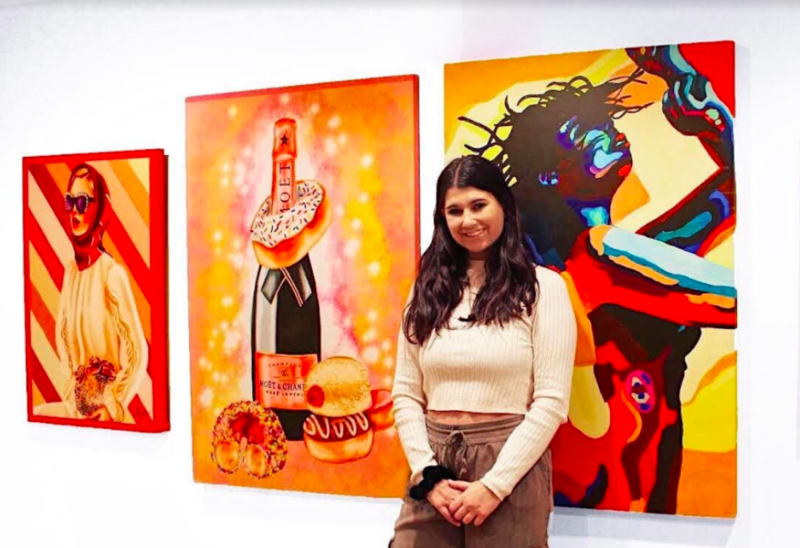 “Over time, I have learned to incorporate my interests, such as pop culture, into my art and I realized that I share these interests with many others,” she said. Steele has designed The Cash Monet’s website to make purchasing as easy as possible. All of Steele’s prints can be purchased as either a canvas or a poster. Worried about sizing? Steele has you covered. Customers can select from a wide variety of size options for each and every print. New products are added every week and Steele is always open to hearing new ideas for her artwork. As a young entrepreneur, Steele has already experienced the highs and lows of starting a business. She has experienced the rejection and doubt that is bestowed upon young entrepreneurs. At times, it can be very difficult. That said, Steele recommends that would-be entrepreneurs take the leap. “You should not be scared to take the leap and become a business owner,” she says. This is for a variety of reasons, but most notably due to the power of the internet and social media. Steele says that “social media gives a platform to any aspiring entrepreneur to grow their business and cultivate a client base, without having to pay for traditional advertising.” It is this power of social media that allows an unknown artist or creator to become the next big thing. All would-be entrepreneurs need to do is create, tell others about their creation, and see what happens next. But while being resourceful is one thing, there is one caveat. Steele says that “patience is key,” adding “It takes time to build a successful business.” Because of this, it is important not to get discouraged when you don’t see immediate results. As the familiar mantra goes, “overnight successes” are years in the making. Sydney Steele is an artist and entrepreneur who loves what she does. She is in the business of creating beautiful, compelling art while connecting with and satisfying her customers. While it is unclear what The Cash Monet will look like in several years, it is abundantly clear that Steele will continue to pursue her twin passions of art and entrepreneurship. To learn more about Steele and The Cash Monet, you can visit the company’s website. You can also connect with Steele and The Cash Monet through social media, including Facebook (username is The Cash Monet) and Instagram (username is @thecashmonet).